This Blog is primarily aimed at SAP BW Consultants who are planning to prepare the system for BW/4 HANA and also looking for options to migrate existing objects(DSO, MP) to new HANA Objects(ADSO, CP). We have recently upgraded our BW System from BW 7.5 SP4 to BW 7.5 SP8 with BW/4 HANA Starter Add on Installed. There are some good blogs on the conversion process to deliver BW/4 HANA System, In this blog post i want to mainly concentrate on the Data Flow Migration Tool With Data Transfer option which is available now with BW 7.5 SP8 with BW/4 HANA Starter Kit Installed. Below are the details of Installed software component version. In BW 7.5 SP4, we have used RSO_CONVERT_IPRO_TO_HCPR to convert a Multi provider to Composite provider, by retaining the Same Info Provider name and BEX Queries. As a next step, we have waited for the migration option for complete data flow to new objects with Data transfer. And finally we are there with this upgrade and we have successfully tested the functionality in our Sandbox System. There were couple of issues we have seen and worked with SAP for Solutions and there were pilot notes we applied.So below is how we have started. First upgraded our system from BW 7.5 SP4 to BW 7.5 SP8 with an expectation of having this migration tool available. But we realized, this is not the only pre requisite and SAP is providing this migration tool with data as part of their journey to BW/4 HANA. Then SAP has provided us with 2383530 – Note which had a .XML file and Z program(Z_SAP_BW_NOTE_ANALYZER) for analyzing the notes and then we have applied around 360 notes using the XML file in the note. Finally, we installed 2500045 – Pilot note to install “Transfer Toolkit”. Finally we have the Transfer Tool Kit available in our sandbox system. Note – We are still on the compatibility mode, we haven’t switched our system to B4H. 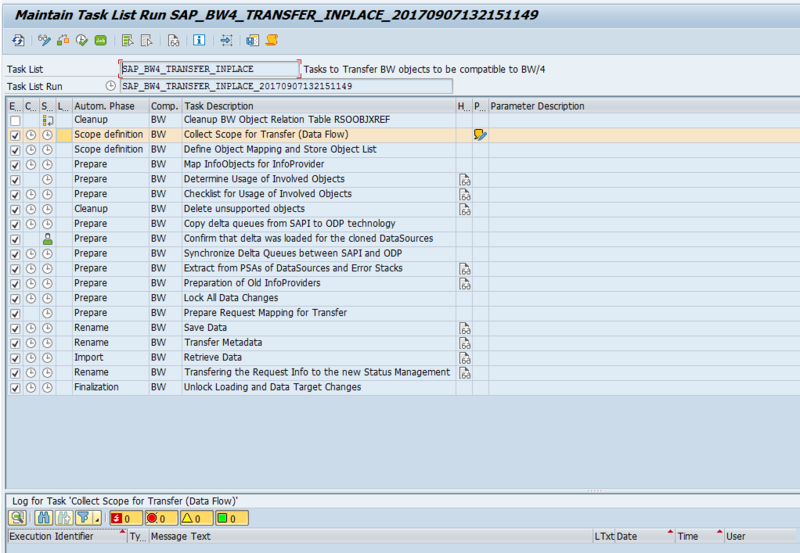 We can either use Program RS_B4HANA_TRF or STC01/STC02 and select Task List as SAP_BW4_TRANSFER_INPLACE. Once you the this, it will create a new task List Run and you will see below options, where we need to define the scope , objects mapping etc. We define the scope for the migration, Which Multi Provider and its data flow we want to migrate. I have used a MP(0TCT_C25), which had a cube(ZTCT_C25) under it. So the expectation is to get this MP converted to a Composite provider and Cube migrated to ADSO with Data and Queries are retained on the new MP with no changes to Enterprise ID’s. Below is the object List, we can select and UN-select the objects to be transferred. Now we see a composite provider with same name and ADSO with same name as cube. We can also see the data copied to new ADSO and also the request management. So this looks very positive so far to us and we haven’t so far tested a data flow migration with a DSO with huge volume( because of sandbox system), But based on the discussions we had with SAP, the data copy should not be an issue with respect to the size of DSO we are transferring. Also as i mentioned in the the steps to install the Migration tool, it is released as part of a pilot note to us. So we have worked along with SAP on few issues and some of them needed a code change and SAP provided a Fix to us.